Did a professor give you a long list of “Course Reserves” that you don’t know what to do with? Course reserves are books, DVDs or other materials that have been taken out of circulation and are being held in a special area of the Library. They are often the most helpful research materials for a class; putting them on reserve ensures that everyone can access them, without any one person getting to them first and hoarding them. But if you’ve never had to use materials on reserve, you may not know how to access them. Fear not! It’s really quite easy. 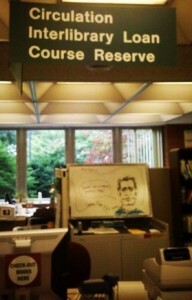 To borrow a book, DVD or other item on reserve, registered students can simply ask for the item at the Circulation Desk. Library staff will retrieve the item and check it out to the student. Students must present their Wildcard in order to access reserve items. The amount of time students can access these materials will vary based on type of item and professor’s request. Books may have a loan period of 2 hours or 1, 3 or 7 days. DVDs and videos placed on reserve are restricted to an in-house loan period of 3 hours. Did you misplace your course reserves list, or don’t have it on hand? You can also browse the list of reserves for a particular class through VuFind by clicking here. Alternately, faculty may request that the library reserve staff make certain readings available online. These may include photocopies of articles, selected book chapters, exams, papers or essays. Students can access Electronic Reserves via “MyNova” and the Blackboard Course Management software. Students must be registered for the class to obtain access to the Electronic Reserve readings. For more information on Course Reserves, click here.